Written for Interactions magazine by Tim Misner. Basing design decisions on customer behavior has roots in mail-order catalogs of the late 19th century, such as Montgomery Ward and Sears, Roebuck. Use-based design grew along with direct mail in the mid-20th century. More recently, the Web created opportunities for collecting data on user behavior. Google is famous for driving decisions with use data. But few designers have experience in basing decisions on data, and many are still uncomfortable with the practice. Now the use-based design model is being applied to hardware. For consumer electronics and office products especially, connecting to networks has become almost standard, creating new opportunities to collect information about user behavior (and about device behavior). In a sense, networked hardware products are very much like Web services—and in many cases hardware products are being integrated with Web services. For a growing class of “monitoring” hardware and services (e.g., network management, security, sports, and health products), collecting user information may even be the primary mission. Taking advantage of these capabilities requires a new model of design as well as a plan to integrate them into the first version of a product. Increasingly, hardware products (especially consumer electronics) include computers, sensors, and connections to the Internet. These capabilities enable changes in what products “know,” how they are used, and how we develop them. They are becoming more like websites. This simple fact became apparent to me during my work at Dash Navigation as their design director. There, I worked on the Dash Express, a personal navigational device (PND) that included GSM networking and exploited the following networked-services principles. Networked services can recognize their users and respond uniquely. Networked services collect information as a natural part of operation. Networked services change continuously, largely based on user actions that feed product improvements. Networked services may also enable field upgrades of software, continually improving the product. At first, however, I didn’t understand how designing an integrated system of hardware, software, and network applications requires a new way of thinking about a product and its development. On one hand, we design end-user applications. On the other, we design platforms for both services and user feedback on these services. provide explicit, periodic methods for the users to submit their opinions from the device. Thematic features of this magnitude require strong executive and product management sponsorship to succeed. This evolution cannot happen without explicitly specifying these needs as a core product feature. Back-haul data, in particular, benefits from discussions between many departments (operations, support, QA, and development), as well as the user experience (UE) team. In fact, it’s quite likely that the other departments will be the initial drivers of the feature. However, UE participation is required to create the kind of infrastructure that allows design iteration based on behavioral data. 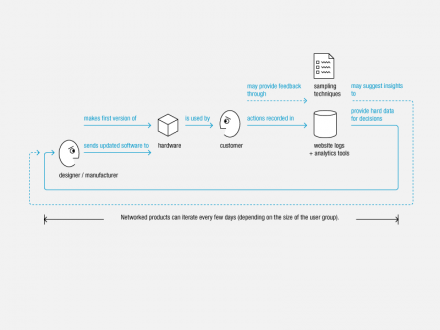 With traditional hardware products, designers have limited knowledge of customer use patterns. Support calls can provide important data on trouble areas (if properly cataloged), but other information is only available from small samples and observers may bias results. Feedback is incomplete and lags actual use considerably. With web sites, designers can have almost complete knowledge of how customers use a service: Which links receive the most traffic? Where in a process do customers drop out? Web sites also allow A/B testing: Which of several examples “performs” better? 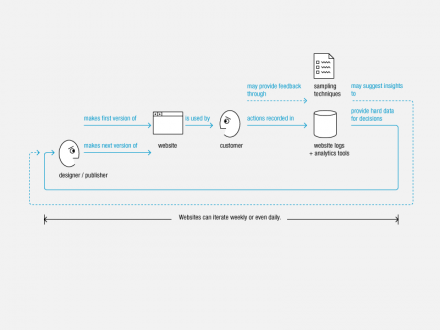 With realtime feedback, use-based design becomes possible. In this regard, web site management is more like direct marketing than traditional hardware or even software development. One great place to start prioritizing your needs is by brainstorming with a broad range of stakeholders about what questions they’d like to answer. Some of the most obvious will be questions that you can’t reasonably or reliably ask users to answer themselves. With behavioral data, we can collect answers from the total user population, not just those who respond to survey requests. Another good place to start is with the statistics that measure, from a product management perspective, whether the feature was successful against business goals. Transmission of sensing data from the device back to a server. For Dash, the sensing data is the driver’s current road and speed; for a medical device, the data might be the monitored patient’s heart rate, blood oxygen level, or glucose level. Automated distribution of software updates to the device. Dash advertises its auto-update feature as an important advantage over competitors. Ability for the manufacturer to configure and diagnose the device. At Dash, the networking-derived functions of the device (real-time traffic, Internet search) are disabled if users let their service plan lapse . Ability for the user to send data from the Web to the device, thus eliminating more tedious device side entry. For the Dash Express, a well-loved function is entering an address by sending it from the web to the car . All of these connected functions can potentially be exploited by UE for research needs. For example, variants of the software can be sent to target user populations for either their subjective feedback or to generate “A/B” test cases. A population’s configuration settings can be analyzed to determine the most and least popular setting changes. Most important, the software development organization can rapidly update the product during usability testing and then observe users for their reactions to the device and its new software. User experience is hardly the only group motivated to scoop up back-haul data. Back-haul data collection is essential for other functions to fulfill their missions. The ability for UE to understand, leverage, and champion these other needs will maximize its influence over the form that back-haul infrastructure takes. In particular, UE needs to realize its stake in the design of these infrastructure components when initial implementations are sketched. A common mistake for typical small UE teams is not seeing the potential at early stages. For example, the operations group will require usage data for authentication and billing. IT needs aggregate usage metrics that trigger alarms when usage levels drop, whether due to instability in its own infrastructure or to service-provider outages. Support needs some form of back-haul data to understand customer issues more efficiently, such as versioning, configuration settings, stack traces , and prior usage. QA values back-haul data on common performance metrics, such as “time until first GPS fix” and “time to first network connection” so that it can assess release readiness. QA also values back-haul data to help track metrics of system performance and stability. With this data, the QA team can better evaluate release readiness. Finally, everyone wants some method to “file a problem report” from the device to reduce the time to file, reproduce, and fix bugs. The UE group has needs distinct from the other functional groups. Both QA and operations, by and large, are more concerned with aggregate numbers than an individual’s experience. Their numbers may say the product is performing as specified, but they don’t indicate if the users are actually happy with that level of performance. For UE design, it is beneficial to triage use cases into buckets such as “frequent for all,” “frequent for some,” or “infrequent for all.” In order to do this, the data source must maintain a marker of individuality along with the data, so the data analyst can slice and dice the data to discover such relationships. In addition, the UE group desires the ability to run longitudinal queries, particularly the ability to see that new user features lead to perceptible user benefits. This requires the UE group itself to create and maintain over time a database of high-level user events in a normalized format. In order to exploit the back-haul data, central sampling issues such as who, what, and when (how frequently) need addressing. Behavioral logging benefits from the ability to understand and filter the results through the lens of various user-grouping mechanisms. For example, stakeholders will question unwelcome results because various outlier groups may have skewed the results. Invariably, both business and operational groups have an interest in creating user segmentation; this functionality is thus almost certainly available to the UE group. However, the grouping mechanisms will be driven by customer purchasing segments, and this in turn can constrain an experiment’s design. Mostly passive, where the problem report is created on behalf of the users. They just need to submit the report. Mostly active, where the user initiates the problem report. Both are, of course, useful. But for devices, the active report is particularly useful, as it is often very difficult to create bug reports independent of a complex environment that only the user fully understands. The simplest and most cost-effective technique is to execute server-side system logging. Then scripts can be run to collect and analyze the logged data. The main advantage of this approach is that little planning is required to generate data because there are no changes to the device code. In the simplest case, an IT operator or engineer adds some logging code (using the existing logging framework) to a server-side component. These changes are usually low risk to any release. This modification gets deployed to the main user population at the next server-side software release. However, back-end logging alone doesn’t provide a rich picture of the user experience because many behavioral issues can be resolved only via data from the device side. In addition, tools construction is required to “extract knowledge from data.” Mike Kuniavasky gives an overview of both the benefits and issues with server-side logging . Logging from the client side is more complex than logging from the server side, because device logging has to handle the transmission of state back to the mother ship. In addition, the organization has to be willing to pay the bandwidth cost required to send back the data. The simplest code approach is to just add a logging function to each “user event” (such as a key-press). This is analogous to a website “click-stream.” The UI framework may have a very small number of places where this logging code could occur. So the implementation can be both simple and broad. The downside, of course, is that an enormous amount of data is generated and transmitted and most of the data is not germane to the user experience questions at hand. Fundamentally, this functionality is only useful for debugging purposes when focused on a small number of users. A more complex approach is to log, for the purposes of a targeted experiment, only the data germane to the researcher’s question. This requires custom code to map between various system states and the user state. This code can be more complex because it is integrated into the application logic as opposed to targeted at a base-system level. In addition, you need to remember to turn it off after the experiment is complete. My experience is that adding this instrumentation is unnecessarily costly when done after the design and initial implementation phase of a project. Don’t shoehorn it in during the beta cycle. Think through the data you want to collect as a fundamental part of sketching and specifying your design. This facilitates a cheaper engineering implementation, but it also allows you to drive design directions from an initial, limited implementation published to a specific user population. With such infrastructure, you can implement a truly iterative, use-based (or data-driven) design approach for your device, just as website designers do today. But to get this infrastructure built in the first place and to exploit it fully, you’ll also need to convince key stakeholders that your complex, sophisticated, stand-alone product can in fact be conceived by your product managers, your designers, and your users, as just another very profitable website. Tim Misner is senior director of software engineering at Oracle. Before joining Oracle, he was director of software engineering at Dash Navigation, makers of Dash Express, a two-way, Internet-connected GPS-based navigation system. Misner also served a stint as director of user experience engineering at Sun. He has a background in product management, engineering, and mathematics. Google and Amazon have built big businesses by collecting and analyzing previously unheard of amounts of data. Their businesses are not accidents. They are not corner cases. They are signals of an emerging future. Several trends point to the same thing: the value of large amounts of data and the ability of that data to support tailoring, learning, and decision making—to enable new categories of business, or perhaps a new model for all businesses. Big data refers to the assembly of very large databases, perhaps first by research in the physical sciences and intelligence gathering by the NSA and the military; followed closely by telephone companies, securities exchanges, credit card companies, and consumer list consolidators (e.g., Acxiom, ChoicePoint, Equifax, Experian, and TransUnion); more recently, Web-based services have begun to generated huge amounts of data. Conversation-based marketing refers to a broad shift from one-size-fits-all broadcast advertising to real one-on-one conversations with customers. The shift began with direct mail that broadened into direct response and direct marketing. Direct mail was one of the first areas to apply big data to drive design decisions and improve customer service. Crowd sourcing is a system (often electronic) that uses large groups of people to collect and organize data. We might propose crowd sourcing as an umbrella term for a range of activities involving large numbers of people: Open source projects that rely on volunteers (e.g., the OED, Wikipedia, Linux); collaborative filtering, the process of making recommendations based on the actions of people with shared traits; Google-style search, which uses links as one of the predictors of relevance; and flash mobs, which quickly form, take collective action, and disperse. Data visualization refers to the application of graphic design principles to making large volumes of data easier to understand—that is, making pictures out of lots of numbers. Today data visualization is a subspecialty at the intersection of the hard sciences, computing, and information design, drawing on the disciplines of statistics, animation, and filmmaking. It will become increasingly important to communications design, interaction design, and service design. Closely related are design of service dashboards and augmented realities (virtual overlays). 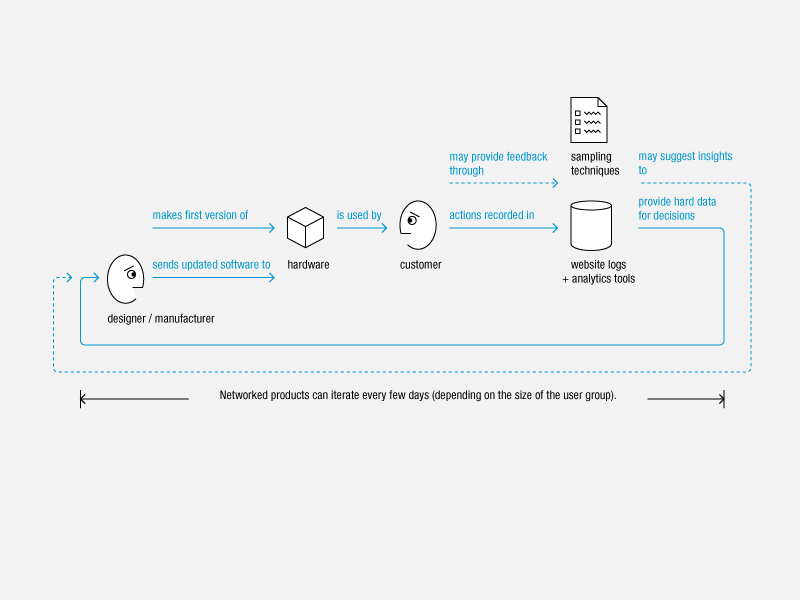 Use-based design refers to a process by which the actions of users are recorded, analyzed, and used to make decisions on changes in the next version of a product or service. Use-based design has roots in the world of direct marketing. Websites created a new level of opportunity. Sites can log every view and click, and enable the testing of alternatives. Google is famous for its data-driven decision making. And now, as more products are connected to the Internet, consumer electronics (and office products) can also log every action users take, providing data to drive decisions for the next version of a product or for interim software upgrades. Cloud computing involves Internet-based services that provide large amounts of computing power on an as needed or lease basis, much as utilities provide electric power. Massive cloud computing refers to recent initiatives by IBM+Google and HP+Yahoo supporting research and development efforts to increase the power and speed of cloud computing systems. London is under surveillance by 400,000 closed-circuit video cameras. Wal-Mart has mandated that all its suppliers build RFID chips into packages that go through its distribution system. Every iPhone includes at least six types of sensors. We are on the cusp of a huge wave of sensor technology. Sensors will be embedded in everything, and they will pour out a continuous flood of data. 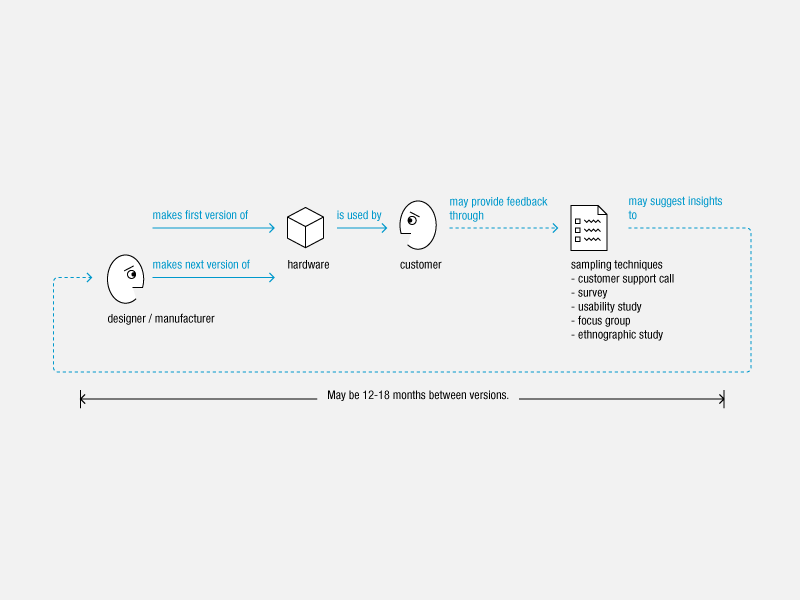 Service design and service science refer to the process of developing and managing services. As hardware becomes increasingly commoditized, services offer opportunity for differentiation. A customer’s experience with a brand may extend across a family of services, each with a collection of touch points. These touch points are increasingly networked, and thus customer behavior may be logged, analyzed, and used to drive improvements. Social media refers to media (communications channels, most often enabled by the Internet) in which users create most (or all) of the content. Users engage in conversations with each other—sometimes about and with businesses that serve them. Participating in social media and its attendant conversations is a growing part of managing relations with customers. Social media are forms of crowd sourcing—or crowd sourcing from another perspective. The next generation of computing will assemble vast stores of data—from a growing array of physical and virtual sensors. These technical and social changes will create opportunities for a wide range of companies. Consumer electronics makers like Apple will monitor their hardware and supporting services. Network-tools makers like Cisco will instrument their customers’ networks. Google (and other Web-services providers) will continue to instrument search and everything you do with their tools. Health care device makers like Johnson & Johnson will increasingly offer services to complement products that continuously monitor your vital signs. Sports and apparel makers like Nike will also build biometric sensors into the soles of their shoes and the fabrics of their clothes, supporting another form of continuous monitoring. Apple, Cisco, Google, Johnson & Johnson, Nike, and others like them will find themselves in essentially the same business, certainly dealing with the same customer management, design management, and information technology management questions. They will have entered the era of customer-data-driven business. This is interesting. And relates closely to what a colleague of mine, Pete Booth (Tin Horse Design, UK) & myself call “digestion”. We have been arguing for some time against a “consumption” model of understanding our long term relationship with designed objects. July 2008: ‘Ecstatic Innovation. Digesting, Designing & Democracy’. With Peter Booth, in Re/Public, http://www.re-public.gr/en/?p=344 Special Issue: “Distributed Creativity & Design”, Ed. Artemis Yagou. July 2008: ‘Design Digestion. A Work in Progress’. With Peter Booth, in Design Principles & Practices: An International Journal. Vol.2 No.3. pp.75-82. And two conference presentations.One of which where we described how these thoughts have led to us re-modelling the design process.